Calculates the B-Spline coefficients of an image. Spline order may be from 0 to 5. Definition at line 73 of file itkBSplineDecompositionImageFilter.h. Definition at line 147 of file itkBSplineDecompositionImageFilter.h. Definition at line 97 of file itkBSplineDecompositionImageFilter.h. Definition at line 83 of file itkBSplineDecompositionImageFilter.h. Definition at line 94 of file itkBSplineDecompositionImageFilter.h. Definition at line 93 of file itkBSplineDecompositionImageFilter.h. 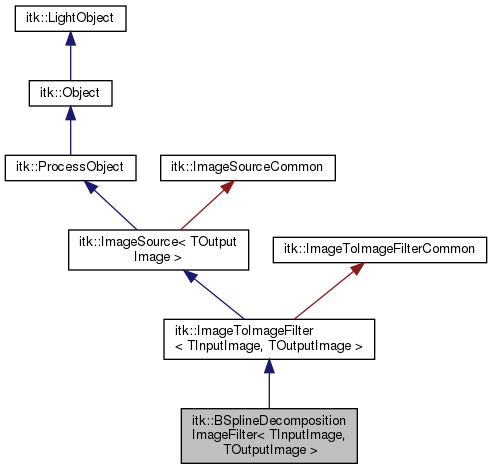 Inherit input and output image types from Superclass. Definition at line 92 of file itkBSplineDecompositionImageFilter.h. Definition at line 95 of file itkBSplineDecompositionImageFilter.h. Definition at line 104 of file itkBSplineDecompositionImageFilter.h. Definition at line 82 of file itkBSplineDecompositionImageFilter.h. Definition at line 80 of file itkBSplineDecompositionImageFilter.h. Definition at line 106 of file itkBSplineDecompositionImageFilter.h. Definition at line 81 of file itkBSplineDecompositionImageFilter.h. Copies a vector of data from the Coefficients image (one line of the output image) to the scratch. Copy the input image into the output image. Used to initialize the Coefficients image before calculation. Copies a vector of data from the scratch to the Coefficients image (one line of the output image). Converts a vector of data to a vector of Spline coefficients. Converts an N-dimension image of data to an equivalent sized image of spline coefficients. This filter must produce all of its output at once. This filter requires all of the input image. Get the number of poles. Get the poles calculated for a given spline order. Determines the first coefficient for the anti-causal filtering of the data. Determines the first coefficient for the causal filtering of the data. Determines the poles given the Spline Order. Get/Sets the Spline Order, supports 0th - 5th order splines. The default is a 3rd order spline. Definition at line 100 of file itkBSplineDecompositionImageFilter.h. Definition at line 184 of file itkBSplineDecompositionImageFilter.h. Direction for iterator incrementing. Default is 0. Definition at line 197 of file itkBSplineDecompositionImageFilter.h. Definition at line 191 of file itkBSplineDecompositionImageFilter.h. Temporary storage for processing of Coefficients. Definition at line 181 of file itkBSplineDecompositionImageFilter.h. User specified spline order (3rd or cubic is the default). Definition at line 187 of file itkBSplineDecompositionImageFilter.h. Definition at line 189 of file itkBSplineDecompositionImageFilter.h. Tolerance used for determining initial causal coefficient. Default is 1e-10. Definition at line 194 of file itkBSplineDecompositionImageFilter.h. Definition at line 101 of file itkBSplineDecompositionImageFilter.h.